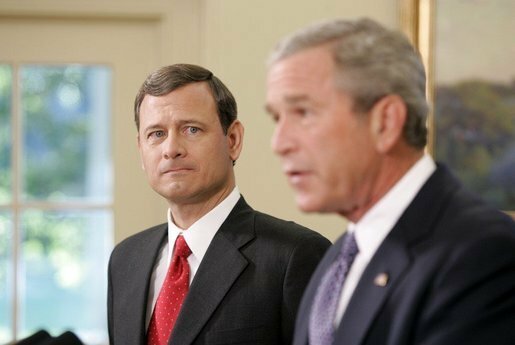 Some assert that a formidable jurist like Chief Justice John Roberts would never be guided by anything but his constitutional scholarship. That is, after all, what we expect from a Supreme Court justice. But more plentiful and more thrilling, of course, were the opinions on the health care ruling that had Roberts in turn furthering, fearing, or sabotaging a liberal, conservative, or neutrality agenda. No question, his decision was highly political and indeed brilliant. Unfortunately for the left, I do not think that it has anything to do with Roberts mellowing his conservative stance, not even for the purpose of creating the appearance of an impartial court. I tend to believe that things are what they look like, that the simple explanation is probably the right one, that intention is best inferred from looking at the results. Rewind to 2005. George W. Bush was president and pursued a, hm, severely conservative agenda. Leaving liberal foes and political commentators stunned, he wielded power without inhibitions. Well, he surely did. Every time, even in the smallest of matters. Like using a recess appointment to make declared enemy of the world John Bolton ambassador to the United Nations which did not serve any purpose other than saying “Oh yes, I can”. While being ridiculed by his opponents as gaffe-prone and intellectually inferior, he was in truth one of the most consistent and effective presidents (measured by his agenda and beliefs) in a long time. So when Bush nominated a new chief justice, did we expect him to bend over backwards picking a reasonably moderate candidate to foster civility and the greater good? No way. Bush had an agenda that he pursued with impudence, and here was his opportunity to extend it for as long as humanly possible. Only Democrats would fumble such an opportunity. From all we know, and should expect, Roberts is of the same mettle. He, too, shows no inhibitions when it comes to implementing a severely conservative agenda, does not let himself be restrained by neither civility nor impartiality, by neither court rules nor precedent. So this guy, in a position of life-tenured power, would suddenly be worried about the impartial appearance of his court? Because Obamacare would be just that one bridge too far? Because the public would… do what? Occupy the court? No, any thought that Roberts would have been intimidated by an angry mob or the president’s badgering is an insult to the man. Even less likely is the scenario that Roberts drifted to the left. Sure, liberals always believe that the a man can be rehabilitated, but I fear they would find Roberts a habitual offender. There is no doubt in my mind that the simple explanation holds true, as usual: Roberts is still a severe conservative, and this vote is how he believes to best further his agenda. Of course he feels a sense of stewardship for the court as a whole. However, this is not about shaping the public perception of the court, but about shaping the court. And the court is shaped not by brilliant legal opinions but, alas, by majorities. Sure, some of the court’s decisions have changed the course of history, and we marvel at their legal reasoning and compelling dictum. But the respective dissents are often no less brilliant, written in good faith by equally potent scholars of constitutional law, their only shortcoming being that they did not muster enough votes. If a decision stands for two centuries, it’s not because of the infallibility of its reasoning but simply because in two hundred years there were not enough justices who felt a need to overturn it. Stare decisis is not an enforceable rule, as the Roberts court has proven in abundance. Rather, it is a convenient argument for those who happen to agree with the decision in question. Ironically, the Supreme Court is the one place where the “government of laws and not of men” paradigm does not hold true. For Chief Justice Roberts to build a severely conservative legacy, he probably worries not as much about clever Commerce Clause interpretations as he does about the composition of the court during the next decades. And the only way to alleviate his worries is to have a severely conservative president pretty soon. Arizona merely asserted the supremacy of federal law over state law. The one true civil rights issue – “show me your papers” – was upheld. The others can be fixed easily by a conservative Congress. The same is true for Obamacare: While the law was upheld in court, it’s easy to repeal (and the opinion said as much). What’s more, the constitutional reasoning favors conservative lines of thought, and has a potential to wreck federal welfare and civil rights legislation. It speaks to the depth of Roberts’ convictions, and indeed his stature as a strategist, that he not only acts to help Romney get elected, but at the same time he bases his actions on the assumption the he will succeed. He simply doubles down on the risk. But I believe that as the natural power player that Roberts is, he would have intuitively seized on this Grand Slam opportunity as it presented itself to him. He would not write an opinion in order to hand the election to Mitt Romney – he knows that his actual influence in November might be marginal. Yet some such synapses may have fired as he was grappling with his decision which is certainly not a clear read from the constitution one way or another. President Obama will have to seize on the one risk that Roberts took: The Obamacare victory makes him look successful. Fundamentally, Americans do not like losers. Unfortunately for Obama, though, as much as a loss might have cost him, the win is likely to be a “don’t care” by November. Alternatively, he could start to convey the dangers of a Republican president solidifying the conservative Supreme Court majority for decades to come. Obama could credibly argue that no matter how terrible his presidency, he is the only one that can prevent a constitutional Armageddon for Democrats of all shades. Sadly, the pretense of a purely judicial Supreme Court and the president’s understandable reluctance to classify his term in office as terrible make such a conversation unlikely.